For me, this is one of those rare series that can instantly turn a bad day into a good one. It has friendly characters, stories that makes you think or feel and an atmosphere that is both comforting and eerie. It also has a talking cat that can turn into a big flying dragon! 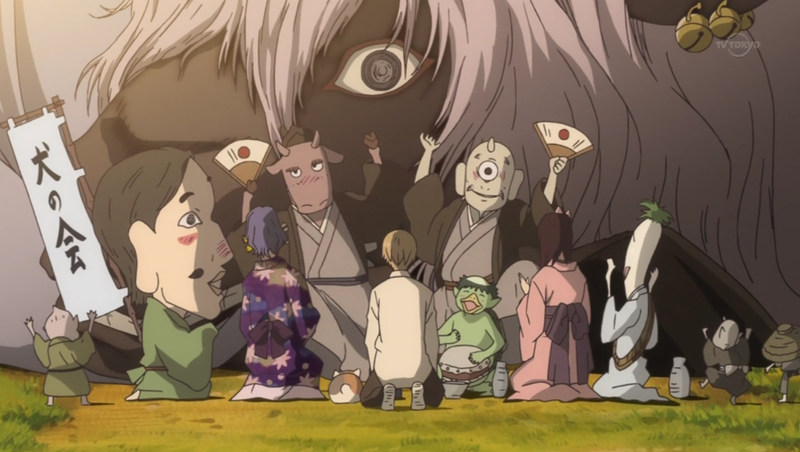 When the second season, Zoku Natsume Yuujinchou, ended in 2009 there were no signs of a third season. But prayers were heard and two years later Natsume Yuujinchou San showed up out of the blue. Even more surprising was that the fourth season, Natsume Yuujinchou Shi, would air only three months after! This also turned out to be the final anime series of the franchise, if the ending of the fourth season is to judge by (“The End”). This is perfectly fine, if you ask me. While I would watch a fifth season, there is simply no need for it. I do know the manga is still going, but the theme of the series is over now. The first season was about loneliness and Natsume meeting and learning about other humans and youkai. The second season was about deciding what he values most: humans or youkai? The third season was about friendship, family and trust. The fourth season was about growing up, conflict and acceptance. As you can see, our main character Natsume has grown a lot throughout the series and each season has had its own overall theme. With the fourth season everything of importance is over, as he has chosen to accept his life as it is. It is perfect now and anything more would simply be padding. 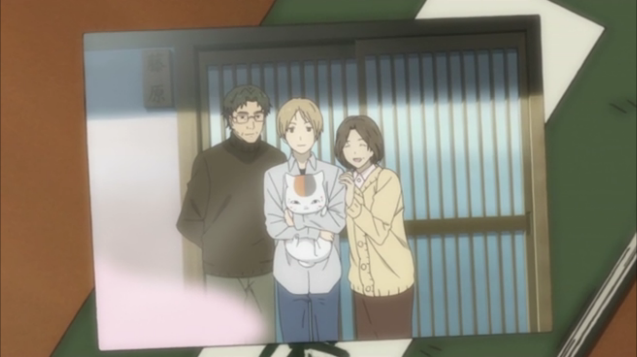 2012 is the year Natsume Yuujinchou said farewell. I wave my hands and accept its leave. This entry was posted in Anime, Christmas, Natsume Yuujinchou Shi, Reviews, Series and tagged 12 Days of Christmas, Conflict, Ending, Farewell, Friendship, Heartwarming, Natsume Yuujinchou, Natsume Yuujinchou is better than Mushishi, Supernatural, Winter. I think I stopped being delusional about Natsume when I realized that several episodes were just badly written and had inconsistencies in presentation. Also, you claim there has been some kind of development, but did that actually happen? Every so-called development was immediately reset and we were back to status quo. So Natsume realizes that he has to leave his past behind? Awesome! The episode after the next one would still be about his angsty childhood adventures when everyone blamed him for the youkais’ doing. Talk about redundant. And spending dozens of episodes on his saaaaad past when he’s quite obviously having a very happy life in the present is certainly what well-written shows do. Remember, disconnect your episodes from the ongoing plot as much as possible! A bunch of shallow inner monologues implying some kind of development will still do the trick! And all of that clearly matters because he’s an aaaaangsty teenager! I never felt anything you mention. And yes, I’d argue there was development. But it’s not from one episode to another like certain series. If you look at an episode from the first season and then compare it to one from the fourth, you will notice a difference. If you don’t… then I’m afraid I cannot help you. You only seem to get annoyed when there is any kind of drama going on, which leads to dumb whining from your part (aaaangst aaaaaangst). No offense, but it’s getting rather tiresome. The last season was probably my favourite, simply because it provided the most emotion out of any of them. I would honestly prefer if the didn’t animate any more than this, simply because that ending felt like the perfect way to cap off the series. If I had to put them in order, it would be 1>4>2>3. I was still more emotionally involved in the episodes of the first season, since they touched upon loneliness much more. Guess I’m a sucker for that? As I said above, I still feel the first season is the strongest one, but they were all really good. How was Minami-Ke? I dropped it after the first season because of the new art-style. Well, true, it does sell well. If Brain’s Base need money, it wouldn’t surprise me if they announced a fifth season. I love to have another season. I watched all four seasons just this year. Watching an episode each day so that I can feel it more. This is the most heartwarming anime I’ve ever crossed upon. One of my favorites 🙂 The characters are very likeable, especially Natsume. I sometimes found myself daydreaming that I am one of his friends! So yeah 🙂 One of the best! I’ve also read the manga up until volume 10 and even if the story keeps being relaxing and interesting I can’t figure where everithing is going to go. I mean, the manga already explored the loneliness, a conflictual past, friendship, the acceptance of Natsume as he is now with his present life, what also could be said? maybe some romantic turn? Who knows. Anyway I’m glad to have read and whatched this story!! If anything, I guess the series could expand upon the exorcists or Reiko (I mean, her importance disappeared after the first two seasons). I mean if I’m not mistaking, nobody never esplained from where Natsume and Reiko ability to see youkai came from. Probably Takashi inherited it form Reiko, or so it’s suggested, but Reiko? This would be an interesting point. And another interesting thing would be more explanatiosn about Matoba and the exorcists “association”. This would be maybe less hearthtouching but still interesting. Fifth season is coming soon!